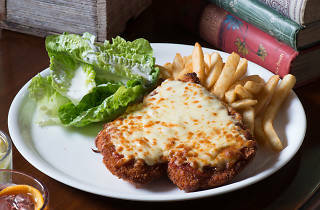 Is hard to argue with a good chicken parmigiana for dinner, and now Forester's Pub and Dining is making its case for dinner time deliciousness even stronger by dishing out the counter classic for just $5, every night of the week. When you purchase any drink you can get a parma for pocket change, every night from 4pm-10pm. 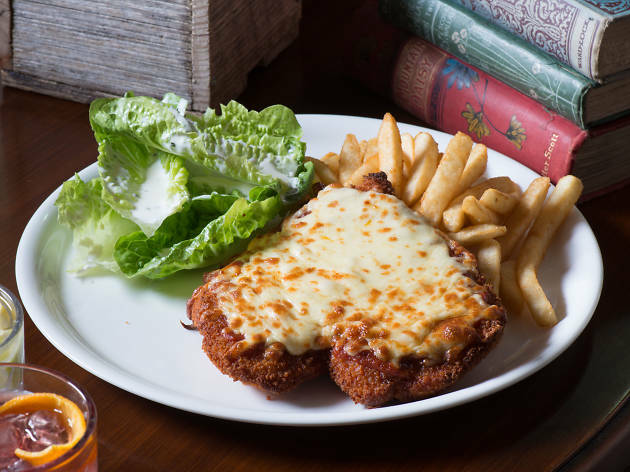 Whether it's an after-work feed or a Sunday session, you can head into this much loved Collingwood corner pub and order up a golden and crisp chicken schnitty topped with napoli sauce and cheese, served with baby cos salad and fries, or go veggo and try it with eggplant. In early 2017, under the watchful eye of Dave Langlands (who also manages the Terminus in Clifton Hill), this late-night beer hall got a new lease on life. The cavernous space has been split down the middle with low shelving draped in vines. High bar tables run the length of the bar side, while the main part of the room is now a dining area, filled with comfy booth seating – making it the perfect spot for a schnitzel. Add in 40 craft beer taps and a friendly vibe and you've got a damn good case for ordering up a parma any night of the week.